After watching the 2nd episode of the excellent new BBC series The Normans, I´ve taken an opportunity to contribute a post about a norman monument in the area. 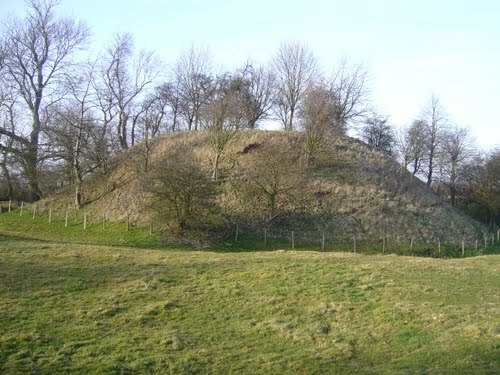 3 Miles east of Tamworth is the village of Seckington which has on the edges of the village a satisfingly complete early Norman motte and bailey earthwork. It’s a remnant of the heady days of Norman conquest and would have probably been built in a largely hostile area with forced labour. It was surmounted by a wooden structure and was one of many throughout England, made to establish control over their new subjects. It was built by the earl of Mellant in the 11th century or his son Robert earl of Leicester. 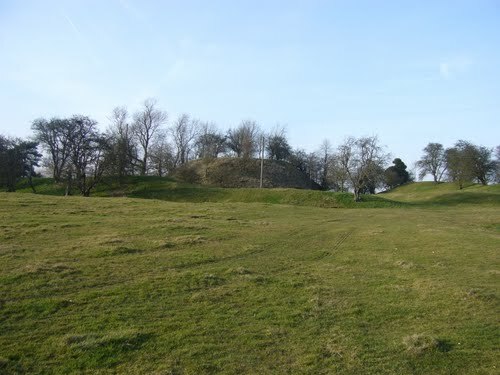 One of the most satisfying aspects of the earthwork was that it was abandoned early on and so didn´t emerge as a masonry built castle like the nearby Tamworth castle, in a sense its a fossilised Norman early Motte and Bailey earthwork. Another satisfying aspect is its excellent state of conservation, with its great conical shape, survival of the ditches and signs of ramp on SW slope. Third satisfying point, its location, on the edge of an idyllic village surround by slightly undulating fields(possibly remains of medieval ridge and furrow fields) whereas directly behind it to the north is the busy Ashby road,which its cheekily obscured from. How many times have people passed right next to it and never known about this wonderful earthwork. fourthly is its size it’s quite small in a satisfying put in your pocket sort of way. Finally the last satisfying point is it’s a great place to lie around and hang out with people or alone, weather permitting. Put all that together and you have got a lot of satisfaction. Seckington was the site of a royal murder. Ethalbald, king of Mercia was murdered here according to Bede by his bodyguards in 757 AD.